The creative process begins right away; from the moment I am contacted by a bride to the final stages of construction. Once I have a basic idea of what the bride is after, I do a few watercolour fashion illustrations of my designs so that the bride can get a clear understanding of what the gown will look like. We then meet in my studio to discuss design details and fabric options. If the bride likes pieces of one gown, and pieces of another, then I do a new illustration and we go from there. The next step is making up a calico toille – a fancy word for ‘mock-up’. This is essentially a basic version of their gown made up in cotton so that we can see the proportions, sizing and other details on her body. There are generally two to three fittings in the calico before we get to the really exciting fittings in the actual fabric. The third and fourth fittings are always my favourite, as they’re the ones where the gown is fitted perfectly, and then created in the beautiful bridal fabric (chosen by the bride from my sample books). The fittings then move on fairly quickly as we add lace, beading and whichever embellishments the bride desires. During these final stages there is always room to change and adapt the gown. As each Kimberley Woodward Designs wedding dress is unique in design and timeframe, all gowns require different lengths of time. It’s definitely a big process; but one that I absolutely love! 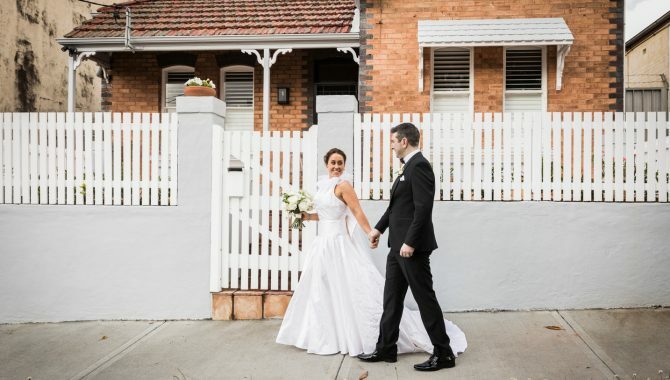 Custom wedding dresses usually require a minimum of 4 months to create, however if you are running short on time please don’t hesitate to ask as I can generally be quite flexible with timelines – I have made beautifully beaded gowns in 5 weeks, and I have made elegant, simple gowns over 12 months! I do not charge a consultation fee, however consultations are strictly by appointment only. This allows me to chat with you one on one and maintain the highest level of quality in my work, while also dividing my time appropriately between consultations, fittings, and sewing time. Budgets can be discussed in your enquiry emails beforehand, and I do ask that respect is shown and initial consultations are only booked if you are seriously interested in having your dream wedding dress made. Most bridal gowns tend to cost between $2,500 and $5,500, but ultimately this depends on the final design and fabric choices etc. If in doubt, just ask! DO I NEED AN APPOINTMENT, AND CAN I BRING OTHERS WITH ME? An appointment is essential to ensure we are able to chat and browse through fabrics etc uninterrupted – this also allows me to divide my time appropriately between each customer. You are more than welcome to bring a few family members and friends with you to any of your appointments, however please keep in mind that my studio is quite intimate and cannot accommodate large groups. Unless otherwise specified, each item or garment is made to order and will generally take 3-5 days to create, and roughly 1-2 weeks to deliver, depending on your location. If you require an item or garment urgently, simply send an email enquiry and you will be contacted ASAP to let you know if this is possible. Shipping through Australia Post is a flat-rate fee of $10 Australia wide. If you are unsure of your dress size or would like to request changes or a custom made item or garment, please don’t hesitate to send an email enquiry with all your available details and you will be contacted ASAP to arrange your personal item or garment. Your receipt of an electronic or other form of order confirmation does not signify our acceptance of your order, nor does it constitute confirmation of our offer to sell. KIMBERLEY WOODWARD DESIGNS reserves the right at any time after receipt of your order to accept or decline your order for any reason. Upon cancellation of an order we will make all reasonable attempts to contact you using the details provided. All received monies will be refunded using the method received. KIMBERLEY WOODWARD DESIGNS, including our directors, partners, shareholders, employees and other third parties associated with running this website is not liable to the maximum extent permitted by law to you or anyone else for any loss of income, profit, contracts, goodwill or financial loss or damage without limitation suffered as a result of negligence or otherwise arising in connection with use of this website or the products sold on it. The delivery times provided by this website are estimates only however, all orders require a minimum of 2 weeks to manufacture and deliver. KIMBERLEY WOODWARD DESIGNS will not be held accountable for late deliveries or loss or damage relating to late deliveries. For further information on deliveries please refer to the ‘Ordering and Delivery’ section. The products offered for sale on this website are made to a customers specific order. No refunds are offered. In cases of a manufacturing fault, items can be returned for replacement/repair. For further questions on replacements or repairs please send an email enquiry. This website is owned and operated by KIMBERLEY WOODWARD DESIGNS. Unless otherwise specified, all materials appearing on this site, including the text, site design, logos, graphics, icons, and images, as well as the selection, assembly and arrangement thereof, are the sole property of KIMBERLEY WOODWARD DESIGNS. You may use the content of this site only for the purpose of shopping on this site or placing an order on this site and for no other purpose. No materials from this site may be copied, reproduced, modified, republished, uploaded, posted, transmitted, or distributed in any form or by any means without KIMBERLEY WOODWARD DESIGNS’ prior written permission. All rights not expressly granted herein are reserved. Any unauthorised use of the materials appearing on this site may violate copyright, trademark and other applicable laws and could result in criminal or civil penalties.